This Brazilian Crystal is not named after the song, Que Sera, sang by Doris Day. However, Que Sera does mean ‘what will be‘. Judy Hall in her book, Life-Changing Crystals, reports this amazing healing stone is a combination of minerals with extremely high and earthy vibrations. She writes Que Sera does it all; it soothes, energizes, rebalances, and restores. It works on every cell in the body. 1. First, hold the Que Sera Stone in your hand and connect to its power, feeling it radiating throughout your body. 2. 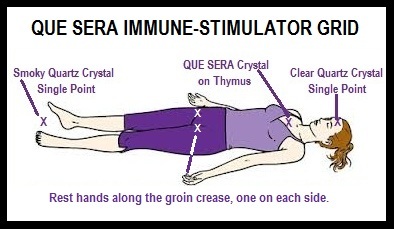 Next, to stimulate the immune system, lie down and place a Que Sera over your thymus gland (about a four inches down from your throat). 3. Place a Clear Quartz (point downward) in the center of your forehead, and a Smoky Quartz (point down) at your feet. 4. Place your hands in the groin crease, one on each side, and lie still for ten minutes. 1. To rebalance the chakras it is great to have seven Que Sera stones one for each chakra. Place a Que Sera on each chakra in turn for a minute or two, starting at the feet. 2. You also can rebalance the chakras by using only one Que Sera stone also starting at the feet. However, cleanse your stone between each chakra.